Congressional Job Searching: Why Research? Several other guides provide additional information relevant to job searching. Check out the Law Library's Employer Research Guide, Career Development page on Researching Employers, and the Kennedy School's guide on Library Resources for your Job Search. Knowing that you'd like to work for a legislator is a good start, but with over 500 members of Congress you'll need to narrow down your options to be most effective. All three services provide up to date contact information for both legislators and their staff members. A few good ways to narrow your search are by: Location, Party Affiliation, Area of Interest, and Educational Background. You have the ability to limit your search by location in all three services. To search by location LegiStorm go to the "People" Tab and select "Staff Directory." You can then click directly on the State that interests you. To search PoliticoPro for members of Congress and congressional staffers in a particular state click on Congressional Directory at the top of the screen and then enter the state you are interested in under "Filters Results." The list will automatically update to reflect your selection. In Leadership Connect find members of Congress and staffers from a particular state go to "Find Member Staff." From there choose "Staff Criteria, Bio and Location, and select the location you are interested in. This is particularly useful if you want to narrow to several states at the same time. All three services allow you to limit by Political Party Affiliation. On Legistorm select the desired party on the "Advanced Staff Search" screen and select the desired button beside "Political Party." On PoliticoPro select the "Party" drop down menu to filter by political party. Leadership Connect has the most robust selection, with twenty-one different party affiliations to choose from. You can limit this way by going to "Build to List" and then selecting "Party Affiliation." A unique background or special interest can set you apart from other job seekers. Focusing on legislators working within your own areas of expertise allows you to leverage your experience most effectively. How do you determine a legislator or staff member's interests? There are several methods including looking at the committees they serve on, the caucuses they are a part of, or their listed interests in services that compile this information. In LegiStorm you can either input a committee name in the "Members, Committees, Organizations," field under "Advanced Staff Search" or you can select "Committees and Caucuses" option under the "People" Tab. In PoliticoPro you can filter by committee, caucus, or issue area. Issue area can be particularly helpful when looking at Congressional Staffers, as staffers assigned to particular issue areas will be identified this way. In Leadership Connect under Build a List you can limit based on Area of Expertise. 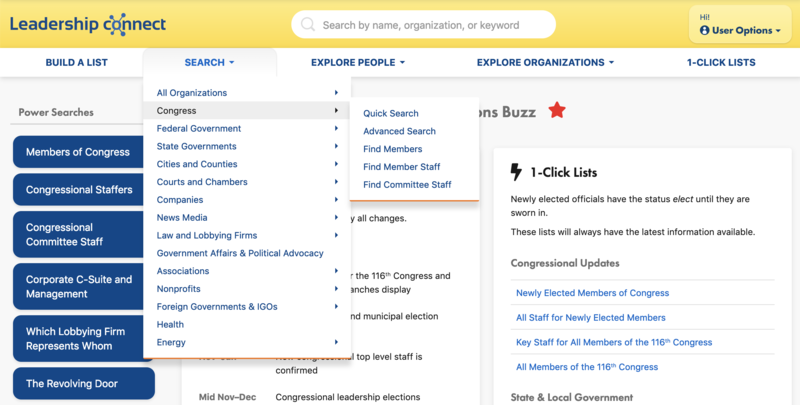 Within the Advanced Search you can limit your search by "Expertise/Legislative Area." One way that people connect, is around their educational background. Someone who attended Harvard Law School might be inclined to connect with a student or another HLS alumni. You can also search for people who graduated from your undergraduate institution. You can search Educational Institution in Legistorm. To do so, go to the "People Tab" and and select "Advanced Staff Search." One of the fields you can search is Education. To find Harvard Law School simply type it in the search field and the list you receive will be limited to Harvard Law School Graduates. In PoliticoPro you can filter by Educational Institution by going to Congressional Directory, and filtering results by Educational Institution. As you type you will receive drop down options that you can select from. On PoliticoPro you can search by specific schools within a University, such as Harvard Law School or Harvard Business School. In PoliticoPro you can include multiple schools in your search. Leadership Connect allows you to search by school, degree, and year of graduation. Go to Build a List and select "Education." While Harvard Law School is not an option under school, note that you can search by school and degree together. Town Hall meetings are a unique way to get a few moments to talk to a Congressional staffer, or even a member of Congress. LegiStorm, provides a tool to locate Town Hall meetings in your area. To access this information go to the Events tab and select "Town Halls." LegiStorm offers verified links to thousands of staffer social media accounts, including Linkedin, Facebook, & Twitter. Once you find a staffer's biographical information page there is a section for social media information that LegiStorm compiled. Shared interests or educational background are great ways to connect while networking. People enjoy talking about subjects that they are passionately working on. Finding areas of interest or educational background can help even after you've narrowed your job search. For instructions on how to do so, see above. One of the best ways to prepare for a salary negotiation is to know what other people in comparable positions earn each year. With LegiStorm you have access to a wealth of salary information. LegiStorm's congressional salary data is complete and accurate, going back to 2000. They continue to update and track this information to provide a "complete picture" of congressional salary information over time. Salary information can also be used to give job searchers an idea of organizational structure and staffer influence. This can help job seekers locate and network with the best possible contact. LegiStorm offers several current awareness tools to help you stay informed. They are all listed under the "News and Reports" tab. Some items might bring hard, breaking news while others provide a joke or two for around the water cooler. All will enlighten about the people or workings of Capitol Hill. Feed provides blurbs that are longer than tweets but shorter than most blog posts. They provide daily reasons for interest, amusement or concern. LegiStorm has a feature called Lightning Alerts which allows you to set up regular alerts for a search. Once you craft your search you can save it and receive regular updates by email daily, weekly, or monthly, if new results appear. You can manage your alerts on your profile page. Track Updates: Select members and staff to receive daily updates on the contacts you care about. Custom White Board Alerts: with 100-200 custom alerts in any given policy area, youcan select pro-active, real-time alerts to ensure they never miss a breaking update on any issue they care about. Custom Article Alerts: you can also elect to receive articles on 100-200 custom topics within any given policy area. Articles take a deeper dive into the analysis—offering the story and predictive analysis of what is to come next—and are written specifically by expert policy reporters for a policy audience. To set up your custom alerts on PoliticoPro, go to "Manage Pro" and you can add whiteboard and article alerts by topic, with many options to customize. To track updates on a member or staff select the person's profile and select the "Receive Updates" button. 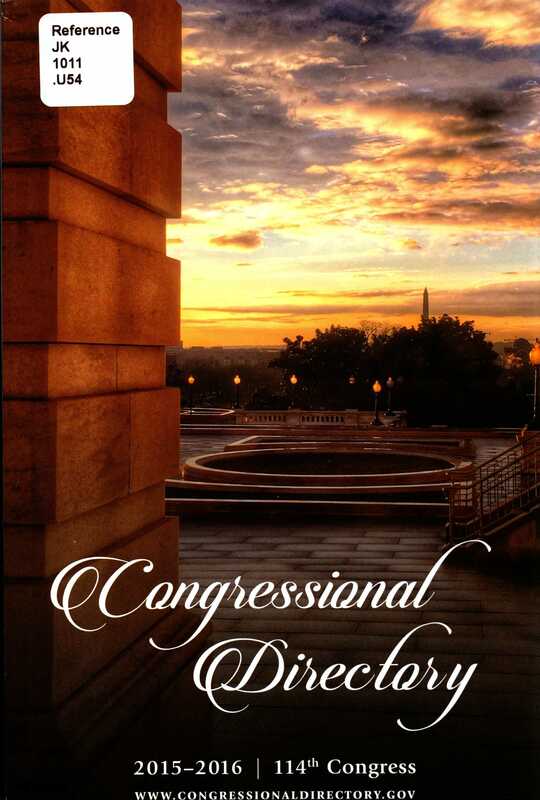 House of Representatives Directory list including District, Name, Party, Room, Phone Number, and Committee Assignment of each member. Directory of Senators including Name, Office Address, Phone Number, and Website Address for each member. 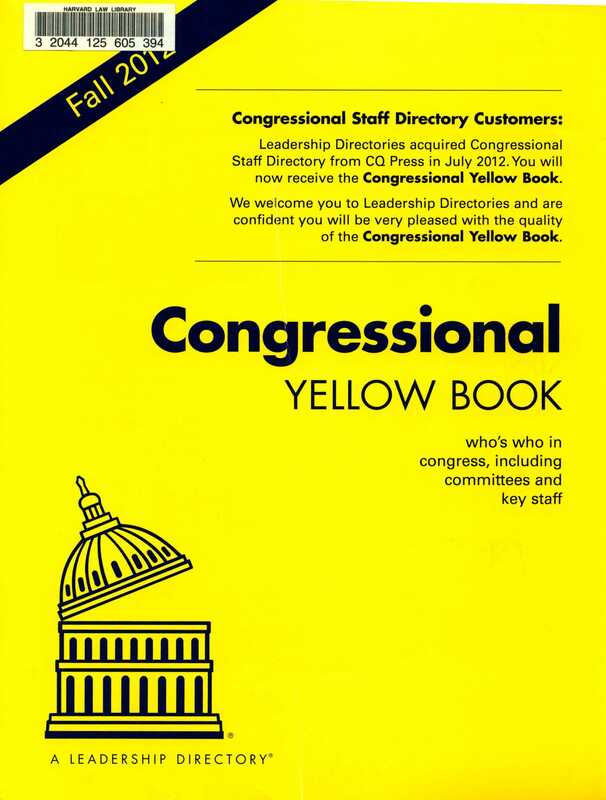 Information on Senators and Representatives, Congressional Administrative Assistants and/or Secretaries, Court Officials, Military Establishments, Federal Departments and Agencies, D.C. Government Officials, Governors of States and Territories, Foreign Diplomats, and Members of the Press, Radio, and Television Galleries.